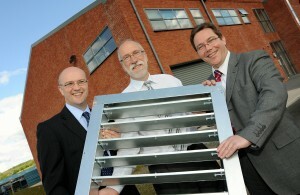 Apreco Ltd, which makes environmental air pressure control equipment for the healthcare and fire protection markets, has expanded to a new headquarters in Bromyard from its previous base in Suckley after growing fire suppression vent sales by almost 500 per cent over a period of 12 months. Apreco had limited export experience in this market sector until it received help and advice from Techmark of University of Warwick Science Park. Now it is doing business in Croatia, Mexico and the United Arab Emirates and sales of its fire suppression vents continue to grow. Mike Hodges, managing director of Apreco, said: “We saw that sales for our fire suppression vents were falling. “We needed to identify the reason. Our clients were happy with the quality of our work and our customer service levels. “We had to question why. We spoke to Dirk Schafer of Techmark and he undertook a detailed market analysis for us in the UK, followed by an analysis of selected export markets. Apreco had to design and develop a new range using the feedback they had received and got a new product to market in quick time with the help of Techmark. To bolster that work, the company also enhanced its marketing communications and sales quickly rose. “The work we did with Techmark has been invaluable,” said Hodges. “Not only do they help us to sort out the UK market we are now exporting the product in large numbers. Dirk Schafer, of Techmark, said: “Businesses that are very successful can sometimes find that sales are dipping – but cannot put their finger on the reason. “In this case, the Apreco product just needed a little update and the market then needed to know about that. “With our help, they could do that and now they have found markets they never thought would be open to them.